Where or when my grandfather, Frederick Arthur Roberts, learned to drive is a mystery to me, but drive he did, both during and after World War 1. The first record I can find is from 12th February 1916 when he enlisted in the AIF as a Motor Driver. Perhaps he was the driver for bread deliveries or supplies when his father moved the family from their 10-acre selections on the “Olinda hill” in 1910 and built a bakery in Monbulk? This seems very unlikely to me on two grounds: affordability and the likely state of the roads in Monbulk at the time! Fred served as a driver in France in the 3rd Australian Ammunition Sub-Park till early in 1918 when he was transferred to the 3rd Australian Divisional Mechanical Transport Company. His Service Record gives few personal details of his experiences during the war: two weeks leave in February 1918 and the “crime” of driving a lorry at excessive speed in June of that year – deprived of 3 day’s pay! Drivers were obviously needed to move people and supplies for some time after the War was over, so his return was delayed till the end of 1919, six months after his anxious mother had written asking whether the F. A. Roberts returning home at that time was her son. It obviously wasn’t! 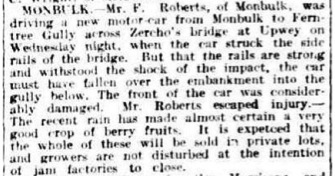 "MONBULK - Mr. F. Roberts, of Monbulk, was driving a new motor car from Monbulk to Ferntree Gully across Zercho's bridge at Upwey on Wednesday night when the car struck the side rails of the bridge. But that the rails are strong and withstood the shock of the impact, the car must have fallen over the embankment into the gully below. The front of the car was considerably damaged. Mr Roberts escaped injury." 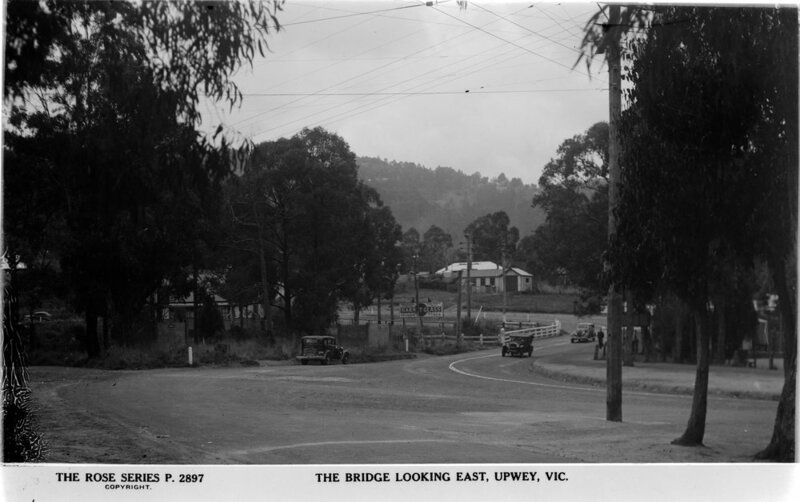 I have not been able to find any reference to Zercho’s bridge but, from the description in the article, assume it must have been the one pictured below where the old Main Road crossed the railway line before turning left and down the hill towards Ferntree Gully. The present Burwood Highway bypasses Upwey township on the far side of the railway line, the section going down towards Ferntree Gully often being referred to as the “mad mile”. Car accidents are a great shock and bother today, but at least, most of the expense of repairs is covered by our insurance. I have no idea if there was such a thing as car insurance in 1922. Having what must have been a very expensive car at the time being damaged would have been a great disappointment. The added expense of repairs would have been quite a burden I suspect.